Last Monday, on May the 4th, citizens around the globe celebrated International Star Wars Day. In honor of this important event, Patrick Thaddeus Jackson and I are pleased to announce an International Studies Association 2016 Conference panel on Star Wars for next year’s meeting. As such (following up on Dan Drezner’s and my Game of Thrones initiative from last year) PTJ and I are not seeking papers that critically analyze the franchise as a political text itself, or that apply pedagogical lessons from the show to the real world national security policy, or that treat the popular cultural artifacts or their fandom as a primary object of study. 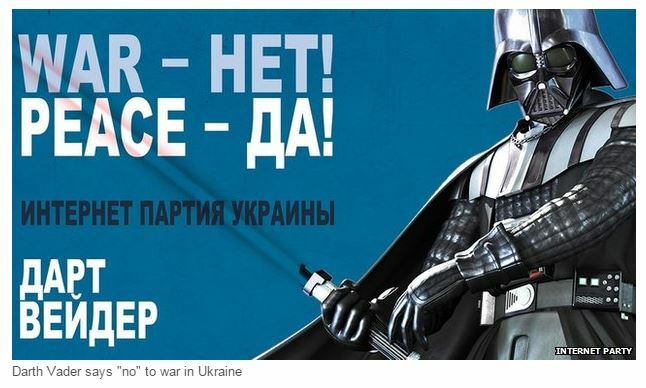 Rather, we are interested in research notes that take seriously popular culture (in this case Star Wars) as implicated in real-world political phenomena in the area of international security, broadly defined. All methodological approaches are welcome, but authors should reflect on or empirically investigate connections between Star Wars’ fictional memes, concepts or allegories and the real-world security-seeking practices of states or other actors – and reflect on those connections. comparative examinations of how Star Wars engenders popular understandings of actual international security processes for different audiences, a research agenda Steve Saideman hints at here. Selected papers will be included on an ISA panel in Atlanta in 2016. We also envision a possible forum in the ISA Journal of Global Security Studies on this theme. To submit an abstract for consideration as part of this project, please email both charli.carpenter@gmail.com and ptjack@mail.american.edu. Please include an abstract, a short cover letter that explains how your paper addresses the explicit theme of this call, your institutional affiliation and all contact information. We are particularly interested in proposals from women, minorities and scholars from the Global South. The deadline for proposals is May 25, 2015. *For the purposes of this project, we distinguish conceptually between “pop culture narratives” and “real world politics” for the purpose of empirically exploring the relationship between the two. However, one must note the distinction between “reality” and “fiction” is somewhat arbitrary given that pop culture artifacts are part of the real world, and that all “reality” is accessed through representations that differ only in the extent to which they are fictionalized. Nonetheless, we argue that there is a qualitative and analytically useful distinction between representations inter-subjectively understood as fictional (e.g. literature and popular culture artifacts) and representations inter-subjectively understood as belonging to lived “reality” (e.g. news stories, political rhetoric, etc). On the distinction between first order and second order representations of political phenomena see Iver Neumann and Dan Nexon, “Harry Potter and the Study of World Politics” in Nexon and Neumann, eds.,Harry Potter and International Relations, p. 7, Roman and Littlefield 2006.